In May 1938 the Summer blockbuster didn't have a sci-fi superhero or cars who turned into weapon wielding machines. The Summer extravaganza was The Adventures of Robin Hood. Directed by Michael Curtiz and William Keighley, this best picture nominee tells the story of the story of the Normans, Saxons, and Prince John trying to steal the throne from his imprisoned brother Richard the Lionheart. 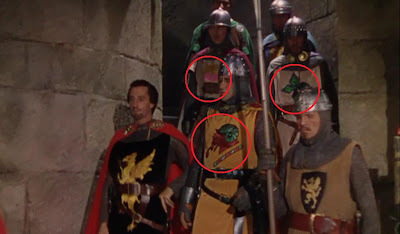 While this is certainly a classic film, watching this film recently I couldn't help but to be struck by the costumes. So different then if this story were made today. 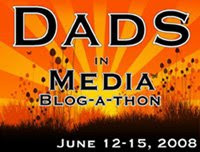 Notice the screenshots provided as some examples. 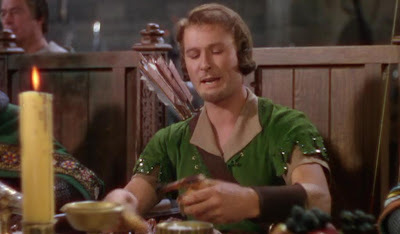 First you have Robin Hood (Errol Flynn) in sequins. He looks more like Peter Pan most the film dashing around in his sequins and green tights. It looks like his mom made the costume for a school play. Birthday Cake, Christmas Goat with Candy Cane, as well as Shamrock. (I have circled these "characters" emblems below). 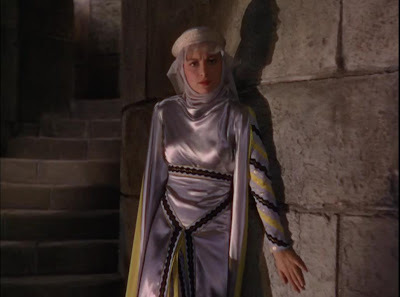 Finally I have the films female star, double Oscar winner Olivia de Havilland dressed in some of the most unattractive outfits one could ever imagine Maid Marian to wear. The film had many excellent qualities but the costumes of Elmer Ellsworth, Ida Greenfield, Rydo Loshak certainly give this film, it's own interesting um...technicolor surprises. I actually like Maid Marion's outfit if it were a different fabric. If this film had been made four decades later, I would have thought she'd be going to the disco! @ crackers - that's what crazy --- they didn't even know what a disco was! You are obviously in the camp with Kevin Costner, who mistook the small steel rivets for sequins. If you have a sense of film and cultural history, you can arrive at a perfect understanding why the Warner film looks and feels the way it does. This is, simply, a Victorian picture book come to life. If you can't grasp that, it is your loss. This is actually a classic motion picture, observing this kind of motion picture i just could hardly aid yet being minted from the halloween costumes. Thus diverse next when this kind of account have been produced nowadays.